The DASH2 is one of Race Technology’s most sought after products whether the application is for competition or road vehicles. It is a clear market leader in price and performance. The DASH2′s construction is of the highest quality with an aluminium frame and military spec connectors, so it is suitable for both open and closed top vehicles as well as motorcycles. Below are some of the main features of the DASH2, click on the relevant hyper-links for further information. Custom LCD panel dashboard display, clearly visible under any light condition, specification. Water resistant for open top or motorcycle applications. Compact and slim, easy to fit. Click here for a dimensioned drawing. Suitable for any engine installation with a fully configurable RPM scale. Optimise your gear changes with the configurable ultra bright shift lights. Road legal, everything required for an MOT or SVA testing including tamper proof odometer, backlit display and mandatory warning lights. Lap and sector time display using a separate data logger. Easy integration with other Race Technology products. Stand alone operation. Connect up to 4 engine or gearbox sensors as well as RPM and wheel speed. 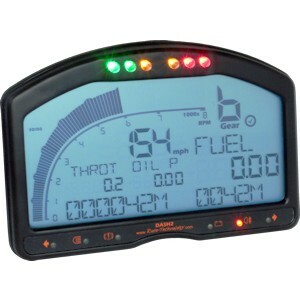 Monitor your engine and display high/low alarms for any parameter. Gear position indicator. Calculated or using a gearbox sensor. User selectable units MPH/miles or KPH/km. Display the information you want to see with 5 user defined screens. Control the DASH2 and a data logger with the external button set (optional). Easy to use configuration software, available free here. Fitting service available at our workshop in Kimbolton, Cambridgeshire. Product comes with 12 months manufacturer warranty. Ask us about list of possible extras that can be added to the dash! Before purchase ask us about lead times as dash will be delivered directly from manufacturer. SKU: DASH2. Category: Dash/ Displays/ Loggers/ Keypads.